Most customers don't ask to see the menu at El Majahual. They already know what they want by the time co-owner Regina Ledesma comes around — be that empanadas, tamales, or Regina's favorite dish, sobrebarriaga a la criolla, a stew of potatoes, beef, and cassava. Diners also trust that Regina's husband and co-owner Hernando Ledesma will prepare their dish perfectly, though that may take a few minutes. "It's a very homemade food," Hernando tells SFist. "You have to wait for it." 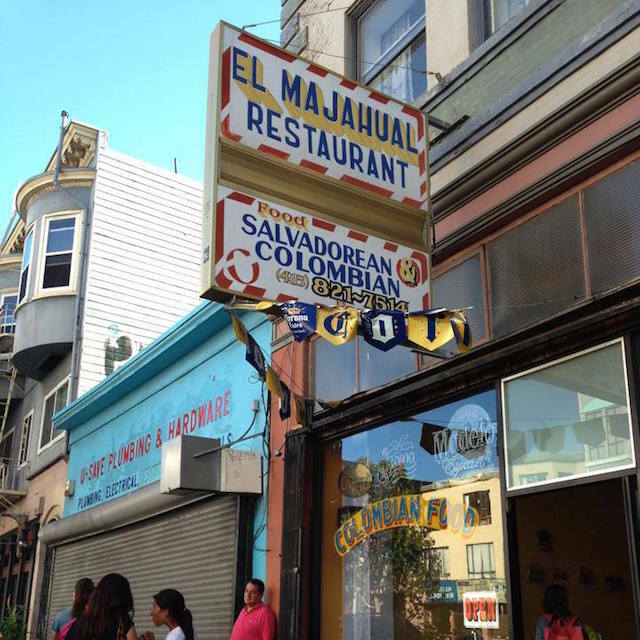 Sadly, when El Majahual closes next week after 23 years in business, those looking for Colombian food in San Francisco will be out of luck. Hernando is Colombian and Regina is Salvadoran, and the couple decided to serve both cuisines at their restaurant as nearby El Valenciano already served Salvadoran. When the Ledesmas were preparing to open El Majahual those many years ago, Hernando's sister had just come from Colombia, and with her help the group perfected their recipes. "I'm sad, yes — for the people," says Regina of her customers, many of whom insisted on recording their names and phone numbers in case Regina and Hernando decide to start catering or end up opening a new restaurant (Hernando would like to — Regina says she has to contain him). But Regina and Hernando aren't sad for themselves. They're not being evicted, they have more time on their lease, and business has always been good. Still, the work is hard and the hours are long. "I don't want to get to the end with back problems," says Hernando. "The most important thing, to me, is we put the food of my country in very high rank in this city." The Ledesmas, who own a home in Oakland, have seen a lot of changes in the Mission District over their more than two decades. The couple moved in to their digs between 22nd and 23rd before City College was across the street. But they've always served their food to a diverse group of diners, they say, and changing demographics haven't hurt them. To make extra money, Hernando and Regina will drive for Uber or Lyft, which they say allows them more flexibility. Regina is thinking of opening a daycare, a past pursuit of hers. Whatever comes next, they hope to have ample time to cook — at home. Remember last fall, when we told you Caitlyn Jenner would be speaking in San Francisco in February? Well, you might as well unremember, because it looks like her entire tour has been canceled.